Have a look at our excellent quality christmas cards to send to your loved ones this year. 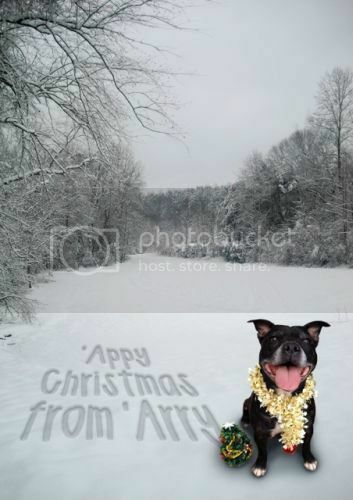 Arry the Staffordshire Bull Terrier was one of the dogs lucky enough to be helped by Rochdale Dog Rescue when he was found abandoned. No one came to collect him during his 7 days at the Stray Dog Kennels and he was signed over into our care. Arry is a lovely boy but being an older Staffie gentleman we knew he would be with us for a little longer. He patiently waited whilst other dogs came and went until a family saw him and knew he was the one. He settled in really well and is very happy to be in his loving home especially as Christmas comes round. The cards are A5 in size and are a really good quality ('Arry made sure of that). The logo is on the back and Arry has written a verse inside. They are 50p each & postage. Please pay by PayPal to the address rochdaledogrescue@btinternet.com, stating that it's for Xmas Cards, how many cards that you require and please make sure the delivery address is on there where you require the cards sending. If you have any queries or would like to pay by another method please do Contact Us.